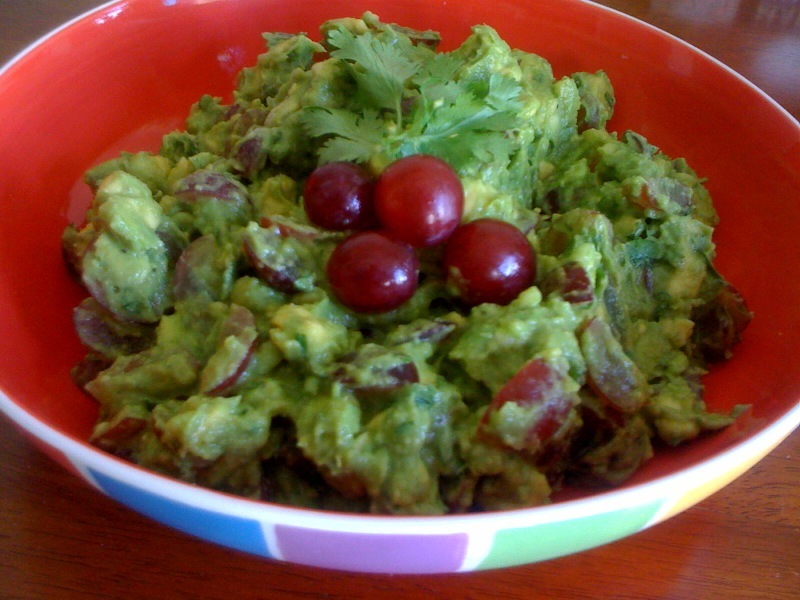 Sweet & Tangy Grape Guacamole | Eat Well. Live Well. Be Well. Combine all ingredients in bowl. Stir together until avocados are well mashed. Leave pits in the bowl until serving to prevent browning. Serve with organic blue corn tortilla chips. I love this stuff, and I think you will too! Enjoy! PS – My husband and I are leaving for vacation for a week in the North East. Then I come home and the next day leave for San Francisco to visit my company’s HQ for a week. Stay tuned for travel posts after the madness takes place! By the way, I made the fresh tomato sauce; Chris liked it. I don’t love tomatoes, but it was pretty good! Thank Jena… I’m glad Chris liked it, and good call on warming it on the stove. For someone who doesn’t like tomatoes, you really stepped outside your comfort zone to try that recipe! On the plane tomorrow, I’m going to make my master training log… for a sprint tri on Oct. 23rd and then the half marathon on Nov. 21st. I’m hoping no injuries stop me. I’m going to pick up the running this week and next and test the foot out. How was the doctor apt? So interesting. What made you think to combine grapes with avocado?? I really am pretty open-minded about what types of food I’ll eat. I’ll try anything at least once. I might miss out on something good If I don’t try it! My Sports Med appt is Tues, I’ll let ya know how that goes. I’m excited for our upcoming half.. a little nervous the Dr is going to tell me no. We shall see! Hope you had a nice flight up to RI. Wow, this sounds so unusual! I will definitely have to try. I just discovered that you’ve posted tons of recipes (vegan recipes even! Yay!) and I’m enjoying going through them. Pingback: My favorite recipes | Eat Well. Live Well. Be Well. Pingback: Book Club: Wrecker | Eat Well. Live Well. Be Well. This recipe is the balls. I dreamed about this guacamole after I tasted it at your place. Freakin’ yum.